The 0588 Reclining Living Room Group by Corinthian at AHFA in the area. Product availability may vary. Contact us for the most current availability on this product. Arm Type Pillow arm rests are often seen on casual furniture and reclining furniture. 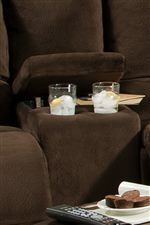 They offer a relaxed look as well as plenty of comfort whether you are sitting up or lying down.